I began to dig into the massive amount of on-line information on the subject. Eventually i decided that my higher self had been directing me to come in contact with the ever elusive sacred crystalline substance. Due to the conspiracy on consciousness existing here in America it is risky, I came to the conclusion that the risk was worth the reward. I had to see if the testimonies were accurate. After enough research and hours of lectures, presentations etc. I'm like lets go! I reach in to my ascension cabinet and grab the Mimosa Hostillis. Taking all the proper precautions careful not to damage this physical form. I went through the whole process, Extraction complete! Before i get into the actual experience i would like to reveal a little about myself. Ever since my "wake up call" I've been seeking to expand. I will admit some days can't be utilized due to circumstances of daily life. While becoming adept in certain areas the feeling won't go away. I must continue to seek everyday. "Seek And Ye Shall Find" but what was i looking for? Truth, spiritual development, love, the most high? Anything i could cypher through the mountains of information on-line, and use intuition to recognize the truth frequency. I was able to re-establish the once severed connection with higher self, for the most part step away from lower self antics. Seeking that which helps me expand in a positive manner is seeming like a quest to infinity. I finally started to see the signs the universe was giving me, Which lead me to reading a few spiritual books like The Kybalion, Ancient Secrets Of The Flower Of Life, The Emerald Tablets Of Thoth. Just to name a few. As well finding things like Qi gong, meditation, Yoga, occult energy work. finding this site. All of which has helped me tremendously! Trust me i have been through the dark knight of the soul! I can personally vouch for things like astral piggy-backing, shadow beings, energy vampires. Sleep walking in a dark trance for years i was as good as dead to the world. To blind to even notice that i had lost that inner child. I think of it as sort of a past life because i have transformed leaving the old me behind. As the veil lifted the doors of perception opened. It was like looking through new eyes at all beauty that was surrounding me. Mother earth Gaia has been here the whole time so i had to take as much blame as all the manipulators of consciosness working against us. For the choices i made in the dark came to light illuminating the fact, that i was as responsible as everything that piled on me while in that low frequency. The spark to change came from within and i feel like the most high granted me a fresh start. I would encourage everyone that is serious on their path to try Dmt atleast once. All the years of ignorance and pineal gland calcification build up. Sometimes you need a tool or catalyst to assist. Dmt is that tool! Now i see why there is such a conspiracy against Dmt. The last thing the cowards that be want is you connecting to the divine matrix. That is what their worthless churches are for. Blocking you from erecting your own temple. Now that mine is up and running meditation has become more visual. Even the darkness has a quality of brightness. I should mention that before i started this experience, during meditation i sent my intention to the most high and Dmt Spirit. Of gaining a level of expansion returning with a deeper knowledge of what is. Not just like oh lets blaze Dmt and get high. This was for my personal growth! As i held in the Dmt my ears started ringing this high pitch tone frequency. I got the feeling that i should lay down immediately or i was going to come crashing down like a ton of bricks. That tone kept growing faster and higher to the point i was starting to wonder if my head was going to explode. Everything had a digital sound to it and i could hear a light humming sound in the background. I closed my eyes and saw the fabric that connects all things, some call it dark matter. The image quickly faded and i started to see dancing circles. Which turned into spinning spiral patterns similar to the beginning of the 2012 Show. This went on for a brief moment then the spinning spirals shape shifted and morphed into some type of mandala. Then i was sucked through the center of a Sri Yantra. Eventually emerging this enormous chamber where a caught a glimpse of Osiris elongated skull and all was present. Keep in mind this entire journey lasted 3 to 5 minutes tops. The giant chamber i was in had what looked like many rooms or balconies up above. Filled with onlookers i got the feeling all eyes were on me. Next i saw the huge being with the ineffable face. Later i was surprised to find this image because its eerily similar what i witnessed. His face looked like it was made of a combination of crystals, diamonds, emeralds, shapes, structures, patterns, reflecting colors i had never seen before. It was doing something i couldn't comprehend. As i floated over to the center of this chamber where the being was, i noticed he opened up a vortex. When i made it to the center of the room i was placed in the vortex. I got a sensation similar to when i'm rotating my energy body during meditation. Except this was way more profound. I could feel every slight degree of the spin as my energy body swirled. I was wrapped around the entire twist 360 at the same time i started to rise up in the vortex field. Before i could get to the next phase i lost connection and started to fall down, all the way down until i landed back in my physical body. I awoke to the Feeling of Dmt paralysis i could only lift my forearms and head off the ground. As i lay there shaking trying not to swallow my tongue. I was blown away from what just transpired. I couldn't stop thinking about it for the next 5 days. Decoding what happened and trying to fit together the multidimensional puzzle. It was like being connected to a limitless divine super computer trying to download and save information to a one megabyte flash drive. Before i could decode 0.05% my system crashed. I found this a couple days later which in hindsight I'm almost 100% sure this where i went. The ancient egyptian inner world. This article is about the Egyptian underworld. For the evergreen tree, see Jambul. For the aviation weather service, see DUATS. 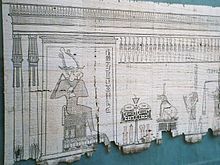 A section of the Egyptian Book of the Dead written on papyrus showing the Weighing of the Heart in Duat where Anubis can be seen on the far right, the scales are shown with the feather balance, and Ammit awaits hearts that she must devour - the presence of Osiris at the gateway to the paradise of Aaru dates the papyrus to a late tradition of the myth. In Egyptian mythology, Duat[pronunciation?] (also Tuat and Tuaut or Akert, Amenthes, Amenti, or Neter-khertet) is the underworld. The Duat is a vast area under the Earth, connected with Nun, the waters of the primordial abyss. The Duat is the realm of the god Osiris and the residence of other gods and supernatural beings. It is the region through which the sun god Ra travels from west to east during the night, and where he battled Apep. It also was the place where people's souls went after death for judgement, though it was not the full extent of the afterlife. Burial chambers formed touching-points between the mundane world and the Duat, and spirits could use tombs to travel back and forth from the Duat. What we know of the Duat principally derives from funerary texts such as Book of Gates, Book of Caverns, Coffin Texts, Amduat and the Book of the Dead. Each of these documents fulfills a different purpose and gives a different perspective on the Duat, and different texts can be inconsistent with one another. The texts which survive differ in age and origin, and it is likely that there was never a single uniform interpretation of the Duat. The geography of Duat is similar in outline to the world the Egyptians knew. There are realistic features like rivers, islands, fields, lakes, mounds and caverns, along with fantastic lakes of fire, walls of iron and trees of turquoise. In the Book of Two Ways, one of the Coffin Texts, there is even a map-like image of the Duat. The Book of the Dead and Coffin Texts were intended to guide people who had recently died through the Duat's dangerous landscape and to a life as an akh or blessed spirit amongst the gods. The dead person must pass a series of gates guarded by dangerous spirits, depicted as human bodies with grotesque heads of animals, insects, torches or knives. These beings have equally grotesque names, for instance "Blood-drinker who comes from the Slaughterhouse" or "One who eats the excrement of his hindquarters". Other features emphasised in these texts are mounds and caverns, inhabited by gods or supernatural animals, which threatened the spirits of the dead. The purpose of the books is not to lay out a geography, but to describe a succession of rites of passage which the dead would have to pass to reach the afterlife. If the deceased successfully passed these unpleasant demons, he or she would reach the Weighing of the Heart. In this ritual, the heart of the deceased was weighed by Anubis, using a feather, representing Ma'at, the goddess of truth and justice. The heart would become out of balance because of failure to follow Ma'at and any hearts heavier or lighter than her feather were rejected and eaten by the Ammit, the Devourer of Souls. Those souls that passed the test would be allowed to travel toward the paradise of Aaru. In spite of the unpleasant inhabitants of the Duat, this was no Hell to which souls were condemned; the nature of Duat is more complex than that. The grotesque spirits of the underworld were not evil, but under the control of the Gods. The Duat was also a residence of gods themselves; as well as Osiris, Anubis, Thoth, Horus, Hathor and Ma'at all appear as a dead soul makes its way toward judgement. It was also in the underworld that the sun, Ra, travelled under the Earth from west to east and was transformed from its aged Atum form into Khepri, the new dawning Sun. Just as a dead person faced many challenges in the Duat, Ra faced attack in the underworld from the evil serpent Apep. have you had any similar experiences ? Without Dmt? Thanks for reading Samuel. Not even close i have had flashing images during meditations and profound dream experiences without dmt but this was on another level. i know those flashing images too! haha... also in some dreams i was able to recall a level of lucidity i had whilst on a mushroom voyage, but only in part. the landscape of my dream itself responded to my level of consciousness, shifting to let me know where in my body i need to move and "level up". have you had any intense experiences with breathing an-el? i received a few big clearings and kundalini rising sensations whilst combining yogic postures, routines and breath work. Hej An-el, thanks for sharing this. Interesting... Would you say this experience actually boosted your conciousness ongoing ie deeper meditation, more lucid dreams? Since my first DMT experience things have been very very different. I think experiences like this are important for helping us to learn to evolve. You really get a strong "more real than real" view on what is truly important. I think every 6 months a "reminder" is perfect. A psychodelic experience of some sort. Remember to respect the journey and to always enter with a true purpose. Very different how so KFive? I agree with you totally man! It can be used as a tool for Mind/Spirit Manifesting. I used to define things without really knowing I was doing it. Defining things by what I classed as "real". The only thing I know now is that I know nothing and that in it's own right has given me an angle on freedom. By no means has it been an easy journey, seeing the truth isn't always pretty. My experience shattered the infinite walls I had built and those walls I call the "EGO". A very humbling event that I feel privileged to have experienced. Do you think i can use phalaris for extraction? It seems not much is growing in y area accept for thisnone..
Sucram, you can use that. I actually have four packs of phalaris seeds that i plan on growing and extracting. This is a more difficult method then Mhrb extraction. From what i read on-line depending on what country your in ordering Mimosa hostillis root bark powder is still legal. It's kind of a grey area now in the US. I heard the US supplier got busted recently a little while back. I'm not risking that, so I'm going to have to try a different method next time. When used properly (vaporized) it is synergistic and a powerful ally on the path to full realization. I suggest deep whole body breathing before during and after the experience, let nothing distract you for as long as possible and do not be blown away or have fear. It's ok if you can't recall everything that happens, it is with you vibrationally. If you can still be conscious of the physical, you may see yourself doing some form of yoga or hand gestures....remember these positions as they are keys. Wholeness.